Drag the material you wish to use. >> Click here to learn about detailed adjustments. In the "Palette", you can find materials to create your video: clips, text/overlays, sound effects, BGM, and your own uploaded pictures. By clicking a tab, you can change items, and by dragging the scroll bar on the right, the materials hiding at the bottom will become visible. Moreover, when you place your cursor on the material (mouse-over), the "Play" icon will appear. By clicking this icon, you can view and listen to the material. If you drag the materials, you can place them on the "Timeline" in your intended section. Note: Please be sure to place video material on the "Timeline" first. Other items from the "Palette" cannot be dragged to the "Timeline" until video has been dragged there. In the "Preview" section, you can play the materials placed on the "Timeline". In order to play or pause, click the "Play" icon found at the bottom left. The vertical blue line (Seek bar) shown on the "Timeline" indicates which part of the video is currently playing. In the "Timeline" section, you can adjust in detail the order of material, timing, which part of the material to use, and text/overlays. 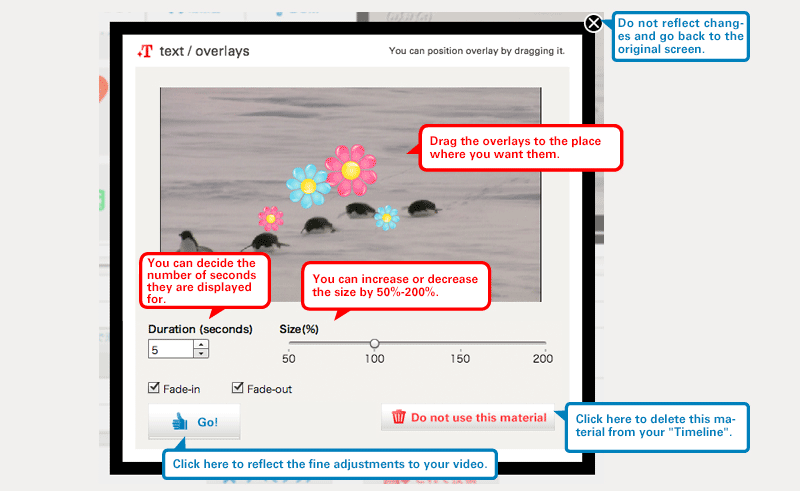 • You cannot place text/overlays or sound effects past the length of the video placed on the "Timeline". 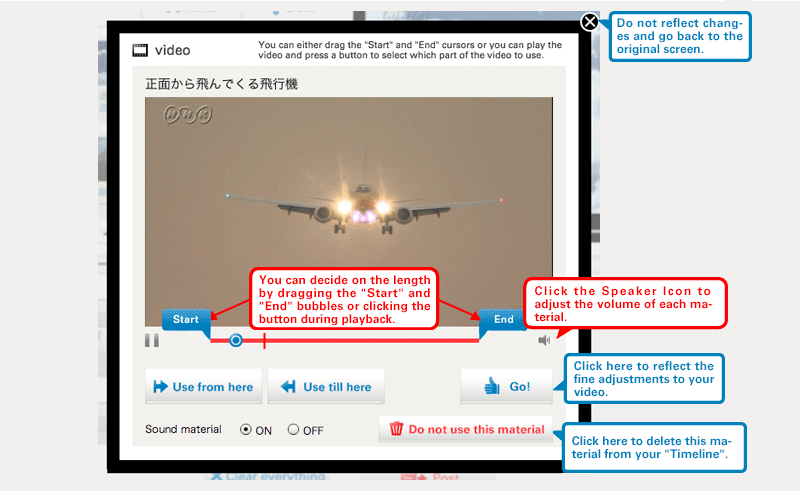 • The maximum number of video materials you can place on the "Timeline" is 30. By dragging the materials placed on the "Timeline" left and right, you can change their order. 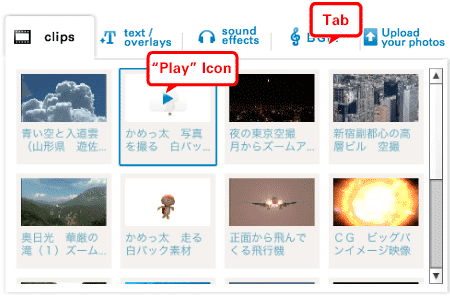 • You cannot place video and BGM materials with a space between them. If you place more than one video and BGM, they will be played back to back. 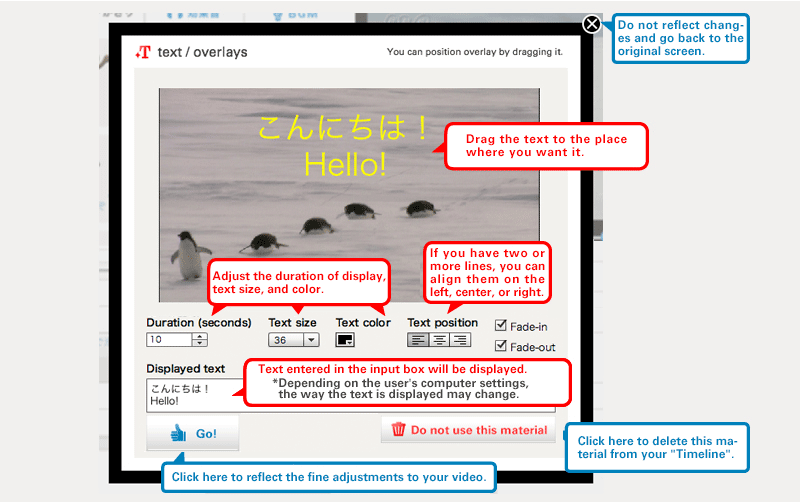 Using the "Timeline" for "Text/overlays 1" and "Text/overlays 2", you can create up to two layers of text and overlays that will be displayed simultaneously. Material on Timeline 1 will be displayed on top and Timeline 2 on the bottom. If you mouse-over the material placed on the "Timeline", a scissor-shaped icon will appear. Click this icon to adjust the material in detail or delete it from the "Timeline". To see what kind of adjustments you can make, view "About detailed adjustments". • Even if you leave the editing tool, you can continue to edit by clicking "Resume editing". By clicking the scissors icon after placing material on the "Timeline", you can perform the adjustments listed below, but make sure you click the "Confirm" button after you make the adjustments. If you don't click this button, the adjustments will not be reflected. 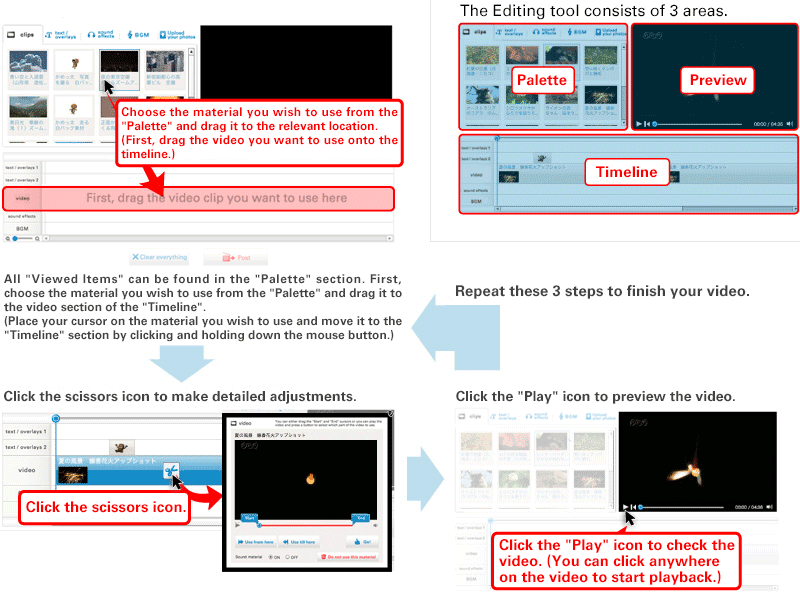 Click to upload your video when it is finished. Look over your video one last time on the confirmation screen. Once you enter your nickname and an explanation of your piece, it will be displayed on the "View Work" page. *If you upload three or more videos using the same nickname, your video will be listed in "Search by Creator" on the "View Work" page. *It may take a few days for your video to go on display.